Composition is perhaps one of the photographers mightiest tools. How you choose to frame any given subject matter will, in the viewer's eye, have a drastic impact. This article focuses on leading lines, but as a primer, I suggest looking over the Focus on Composition: The S Curve and 25 Great Shots That Use Roads and Paths to Enhance the Composition. Like the rule of thirds which is most commonly applied to landscape photographs that include the skyline meeting earth, leading lines allow you to pull the viewer further into an image, move their view to the left, right, top or bottom and even make the viewer feel as if they can see through the image. They are an integral part of nearly every photograph, whether you are aware they are there or not. Leading lines create the focal point, however, they are not always the point of focus. Walking up to this beautiful location, the photographer was faced with two points of interest, the gate and the church itself. Rather than segregate one over the other, he utilized leading lines, via the rule of thirds, to utilize both, so they would be equally important. The stone wall that appears in the lower left pushes the eye to the middle right of the frame, where the gate and sun are, but also apparent in the middle left center portion is the church. When you allow your eye to follow from left to right along the wall to the gate, then right to left again to view the church it becomes apparent the depth this photograph has, beyond the stunning colors and tones. 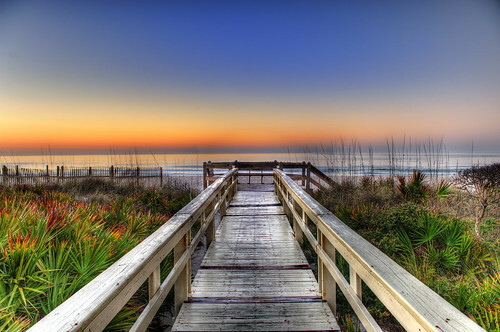 This photograph is titled, Sunrise on the Boardwalk and it's just that, but done so in a way that makes the viewer want to run to the end of the boardwalk and see the sand and ocean. Shooting with a wide lens and allowing the railings to start in the lower left and right sections of the frame, it's impossible to not start viewing there then gradually look deeper out into the sea and notice the sunrise. The photographer has effectively told you how and where to look without any words at all. In virtually every single photograph you take it's possible to identify at least one of these lines, and usually possible to utilize that as a leading line into your photography. Mastering the concept of using leading lines will add more depth to your photography, helping to not only tell your story but also entertain the viewer more.